Vangilder prevails in Non-Pro Ltd.
Jim Vangilder on Take It Eazee. Hart Photography. August 4, Fort Worth, Tex. 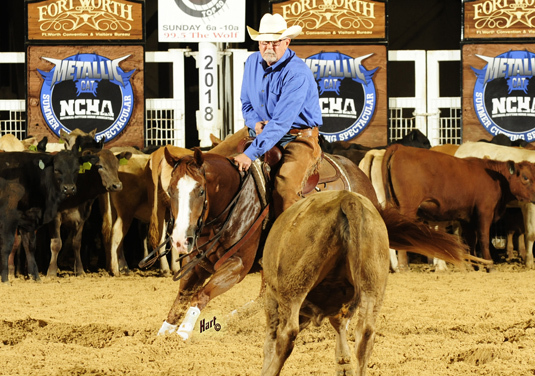 Jim Vangilder, Weatherford, Tex., scored 220 points on Saturday to win the 2018 NCHA/Metallic Cat Summer Spectacular Derby Non-Pro Limited on Take It Eazee, by Smooth As A Cat. Lauren Minshall, Vine Grove, Ky., and her Woody Be Tuff daughter, CR Sister Tuff, claimed reserve with 218 points, while Ali Good, Ringling, Okla., and Sneakish, by Hottish, placed third with 216.5 points. In 2002, Jim Vangilder won the NCHA Derby Non-Pro Limited and the NCHA Derby Amateur championships on the Meradas Money Talks gelding Merada Clone, who Clint Allen, at the time assistant to trainer Matt Gaines, had shown as reserve champion of the 2001 NCHA Futurity Open Limited. Merada Clone would go on to earn over $400,000 with Gaines and Vangilder in the saddle, but when Vangilder won his 2002 NCHA Derby championships, he had been showing for a little more than a year. Today Vangilder, an NCHA Non-Pro Hall of Fame earner of $1,197,911, has a record in Fort Worth, alone, that includes the 2008 NCHA Classic Challenge Non-Pro championship on Pet Squirrel LTE $389,160; the 2005 NCHA Derby Non-Pro and 2006 NCHA Super Stakes Classic Non-Pro championships on Quintan Blue $594,637; and the 2018 NCHA Super Stakes Amateur championship on Smooth Sailing Cat LTE $87,178. Take It Eazee LTE $44,119 is a full brother, out of Zee Dualy LTE $201,899, by Dual Pep, to Smooth Asa Zee LTE $616,978. Lauren Minshall on CR Sister Tuff. Hart Photography. Lauren Minshall, the NCHA earner of $350,593, won the 2013 NCHA Classic Challenge Non-Pro Limited riding Little Sweet Spot LTE $113,915, by Spots Hot. CR Sister Tuff LTE $47,148, was a 2017 NCHA Futurity Open Semi-Finalist and Open Limited Finalist under Gabe Reynolds, who also showed the Woody Be Tuff mare as reserve Open champion of the Augusta Futurity. 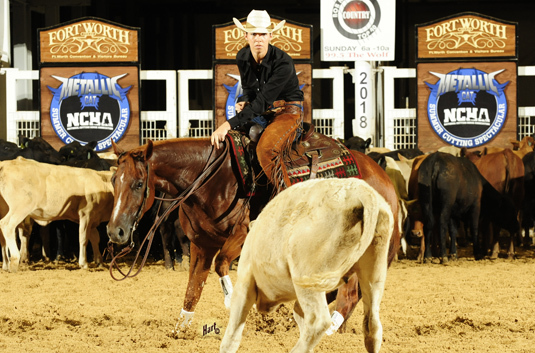 Minshall has shown CR Sister Tuff to place fourth in the 2018 Augusta Futurity Non-Pro and the third in the 2018 NCHA Super Stakes Non-Pro Limited. Ali Good, the NCHA earner of $72,242, and Sneakish LTE $28,523 won the 2017 NCHA Futurity Non-Pro Limited championship and placed in the NCHA Super Stakes Non-Pro Semi-Finals. Sneakish’s dam, Smooth Sneakin LTE $73,716, placed eighth in the 2012 NCHA Derby Non-Pro under Dustin Adams.